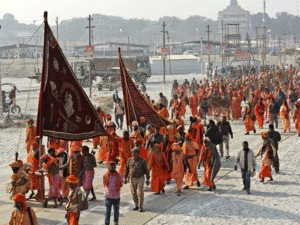 The Kumbh Mela, which attracts thousands of pilgrims, both from India and abroad, was last held at Prayagraj in 2013. It will be held from January to March, 2019. PANAJI: There cannot be a restriction on ‘prasad’ being offered to the Gods, Uttar Pradesh Minister for Civil Aviation Nand Gopal Gupta said on Thursday, when asked if the government would continue to allow the use of marijuana during the 2019 Kumbh Mela celebrations. “Where is any restriction when it comes to offering ‘prasad’ to God,” Gupta asked at a press conference here. He was in Goa on behalf of the Uttar Pradesh government, to invite Governor Mridula Sinha, Chief Minister Manohar Parrikar and the people of Goa for the congregation in Prayagraj, formerly known as Allahabad. This entry was posted in Kumbh and tagged Kumbh, marijuana.